Halloween is almost here! It’s seriously one of the most fun events of the year for both parents and kids. Parents get to enjoy other people doling out the candy. Kids, of course, just love that there is candy. But you want to take your little ones to a place that is Halloween-spooky, not stranger-danger. So here are your top 5 options for a safe and fun trick-or-treat! If you’re looking for daytime Halloween fun, check out this event at Itty Bitty City on Campbell. 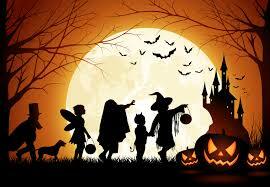 From 9:00 am to 6:00 pm, your little ghouls can enjoy games, crafts, and more. Each kiddo also gets a special treat. Bonus: Boo in The City is included with regular admission to Itty Bitty! If you want the candy and costumes, but aren’t comfortable with Halloween, this may be your place. James River Church is hosting an October 31st party for kids Grade 5 and below. Parents may dress up, too, but they ask that costumes be kid-friendly. From 6:00-9:00 pm, you can pig out on candy, popcorn, and cookies while enjoying games and giant inflatables. Bonus: The Party takes place at all four James River campuses, so you can likely find one close to you. Double-bonus: It’s free. Living on the southside and looking for a non-neighborhood event? Check out Nixa Christian Church for their Trick-or-Treat and Carnival. Plan for family-friendly carnival games, costume contests, food, and even a photo booth. The party runs from 6:00-8:00 pm. Bonus: It’s a free event. Ridgecrest Baptist Church is also hosting a free Halloween event. This one takes place in their parking lot, so dress for the weather (which could be anything this time of year). It’s also a bit unique because your little ones trick-or-treat from car trunks. This year boasts 100 cars, so imagine how much loot there that is. Trunks are open from 6:30-8:30 pm. Bonus: They will have goodies for kids with food allergies. Double-bonus: Nixa Batman will be there! Though it may seem like a relic of the past, neighborhood trick-or-treat is still an actual thing. And there are some fantastic neighborhoods that offer a safe and fun place to do it the old-fashioned way. Roundtree in Springfield is always filled to the brim with eager Halloweeners. And Cobble Creek in Nixa has tons of neighborhood kids filling the streets. Other options are Oak Knolls, Ravenwood, and Southern Hills. So if your local neighborhood isn’t a happening place, or it just doesn’t seem safe, don’t be afraid to take them to a different one. Whatever you choose, have a safe and fun Halloween!